Download a free monthly reading chart and track your goals with the whole family! Divides the Book of Mormon into brief, sequential sections. Teaches essential doctrine in short passages. Uses the actual scriptural text and recognizable verse/column format. Invites discussion with conversation-provoking questions. Filled with original illustrations for a richer learning experience. Offers 5-minute study opportunities for busy families with kids of all ages. 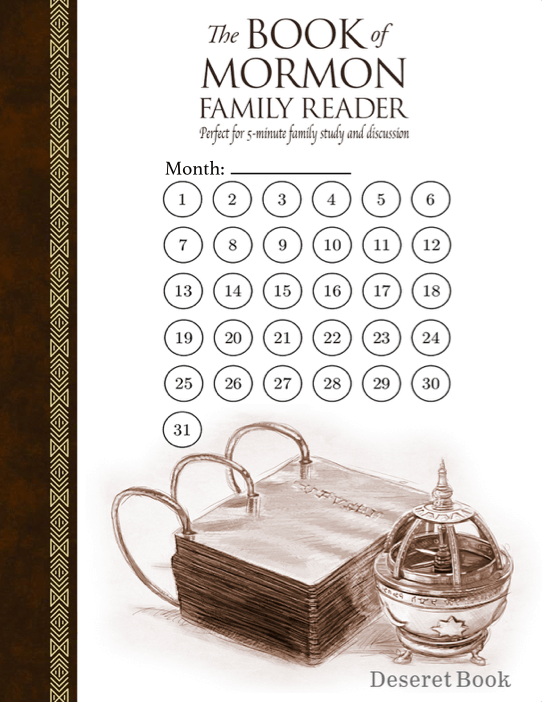 This book provides your family with a simple yet meaningful approach to learning the sacred teachings of the Book of Mormon. You will love how manageable, enjoyable, and enlightening family scripture study can be! Dan Burr, an award-winning illustrator, earned a bachelor of fine arts degree from Utah State University and a master's degree in illustration from Syracuse University. He and his wife, Patti, are the parents of two children and live in Tetonia, Idaho. Dan has illustrated many children's books, including One Little Match, The Miracle of the Wooden Shoes, I Heard the Bells on Christmas Day, The Mansion, and The Christmas Train. Tyler McKellar was born and raised in Teton Valley, Idaho, where he now lives with his wife, Stephanie, and their six children. He served a mission for The Church of Jesus Christ of Latter-day Saints in South Korea and graduated from Brigham Young University with a degree in advertising. He worked for several years as a copywriter at advertising agencies in Salt Lake City, San Francisco, and Portland, Oregon. Most recently he has worked as a freelance writer and screenwriter. He likes college football, golf, milkshakes, and mountain biking. I have been called as the FHE Coordinator for some senior citizens in my ward. They were using the book already which is why I purchased it. I believe it is very well done and it works well for discussion. Unfortunately the book isn’t what we expected. We wanted something to supplement our scripture study and even though it is beautifully presented, the content of passages of scripture and a few questions was disappointing. Sorry. Book of Mormon Family reader is excellent for my 4 grandchildren, ages 7-teenage. It has material suitable for all levels of gospel study. And it only requires only a few minutes daily for each article. I love the stories and illustrations. This has really helped focus our family scripture study! I really like this book for a lot of reasons. I like the explanation and the questions at the end of end section. It is a great set-up and has helped us retain what we are studying. I also very much appreciate that the scriptures are unmodified and are straight from the Book of Mormon. We have struggled in the past to really get our kids to understand during scripture study, but this has helped so much! I have incorporated this book into a summer learning program. I like that the sections are based on 5 min intervals because it really makes it flexible for time management and attention spans. I have 4 boys ages 6-10 years old and some days are more hectic then others. so lessons can be either really quick or we can take longer on scripture study . This is a fabulous book for the whole family to read. Everything is explained very simply and keeps the reader engaged. Excellent book... would definitely recommend! I have been using this as part of my personal scripture study. I love that it introduces it with a brief summary and ends with some insightful questions that I answer in my scripture journal. This is truly a great addition to any scripture study program. I love it! Absolutely the most helpful book ever, to help me be obedient with daily Book of Mormon reading! I now look forward to my scripture reading everyday so much! I love the historical orientation before the scripture, and then the questions to ponder at the end. I have gained so much understanding of the Book of Mormon and how my life relates to it. It makes talking to my children about the scriptures so easy. I recommend this book to everyone! Very skillful selection of scriptures quoted and blending with illustrations makes a very interesting read. Broken into short segments so even little ones stay interested. Very well done. We gave these as gifts to our children and their families this past Christmas. One daughter recently commented “We love it!! We love that it’s the actual scripture verses, but simply broken down where we can read and discuss a little at a time with the kids”. Love the idea and execution of this book. The scriptural excerpts have been thoughtfully chosen, the illustrations are beautiful, and the questions to ponder at the end of each passage help to reinforce the lessons to be learned. Our family has been using this for our daily scripture study. We love the questions at the end of each lesson that helps us think about the scriptures we are reading and how to apply it to our lives. I would recommend this for families & individuals. Each lesson takes about 5 minutes, which is perfect for our family of distracted kids and adults! Beautiful book for family scripture study. Something for everyone. The illustrations, short excerpts, and thought questions let you tailor your scripture study to the different ages and time availability of your family. You won't regret buying it! We love this book for our family! We read it every morning with our 4 kids (ages 11 to 4) and it takes approximately 5 minutes. The questions at the end of each reading are so helpful. Even our 4 year old wants to answer and has thoughtful things to add. The pictures are really beautiful. We love reading directly from the scriptures with our kids, and this is a great way to do that, but helps keep the discussion moving. Highly recommend! This has been a wonderful addition to our family scripture study! The organization of the book and the concise readings have been a perfect way to engage the whole family. The illustrations are absolutely beautiful. One of our favorite parts are the questions at the end of each reading. It has provided a great way to have meaningful, family discussions about gospel topics.